On Radio NZ’s Mediawatch today I heard clips of broadcaster Mike Hosking’s statement of ‘clarification‘ about his work with SkyCity casinos broadcast on NewstalkZB earlier this week. 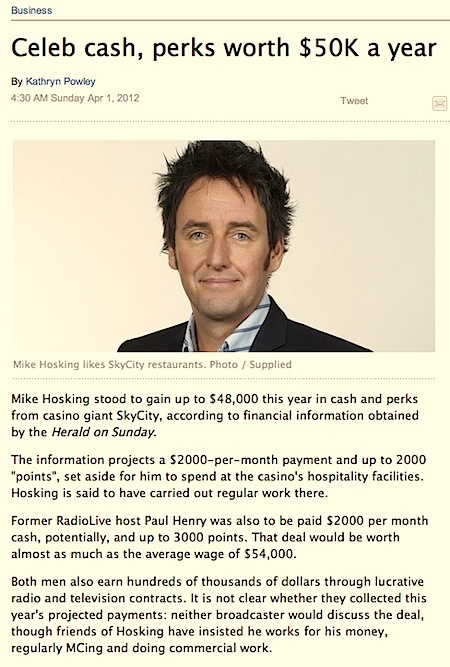 Hosking was responding to commentary and news reports like this and this that he’s received tens of thousands of dollars of cash and benefits from the Casino and restaurant operator — working as an ‘Ambassador’ for the business. He’s media. Of course he is a whore. Who on earth is his hairdresser? 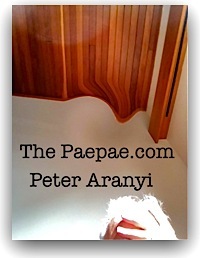 Poormastery is not a hairdresser, but curiously, I understand, my hairdo is regarded as being somewhat controversial. Just this evening, I was criticised for my radical shifts in hair presentation. I have two just looks. 1. Number 1. Very short. I chop and change between the two. I am currently cultivating the latter. As for Mr Hosking, he walks his own step, I assume. Poormastery (please note the 3rd person description) is uninvolved in Mr Hosking’s hairdo. Indeed, I have never met him / or indeed, even heard of him before. I really do hope you are indeed uninvolved in big hoskies do mate … you could possibly get lost for days and may require therapy afterward. He reminds me of an explosion in a mattress factory. So he doesn’t ‘work for them” but does he still take any payment from them? he lacks credibility, he said he didnt tell tvnz because they didnt ask.